Gabriela came to experience our corner of England, speak some English and to play with our Ladies 1st XI, Ladies 2nd XI and the Girls U18s. Gabriela has been a real pleasure to host and we hope she has learned a lot from her experience. She has noticed that our style of play is slightly different. She adapted well to her surroundings, indeed there was some acclimatization involved including at a training session when she commented that she had never seen frost on an astro pitch!! She is a very quick attacker and gives any midfielder or defender on the left hand side a tough time. Considering when she first arrived she had never played an adult game, she very quickly got used to the more physical approach that the adults take and was giving as good as she got. 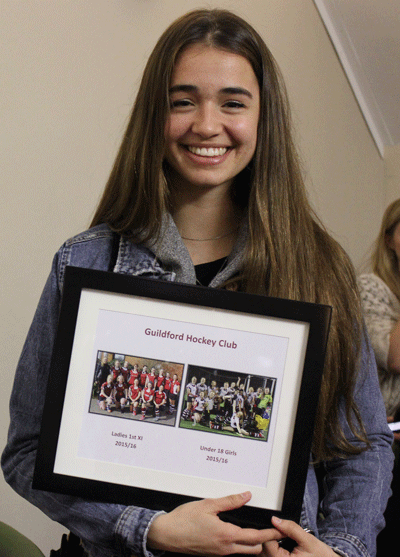 During her stay she played in 8 matches, 4 for the 1st XI, 1 for the 2nd XI and 3 for the under 18’s. She trained on Mondays and Wednesday’s with the Ladies 1’s and thoroughly enjoyed all of the sessions. Off the pitch, her first weekend she joined the Ladies 1’s on a social event and she saw just how competitive First XI captain Jo could be along with the teams’ youngest player Alice as they battled out for the highest score of the day at Top Golf!! The following weekend, Gaby supported the U16 boys in Bournemouth as they qualified for the National Finals and was impressed by their playing. Many thanks go to her hosts Jo Denham, Nicky Spence and Melanie Fergusson; Gaby stayed with each family during her stay. 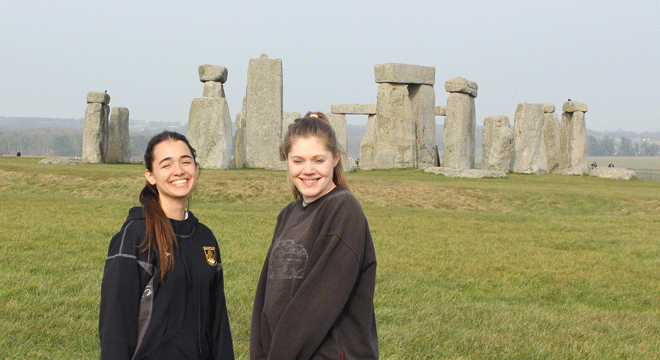 She had several trips up to London, visited the Spinnaker Tower in Portsmouth, and even went to Stonehenge after a game in Andover. She was also able to attend Prior's Field School for a few days where she assisted with the Spanish lessons and also had a day at Farnborough Hill. Thank you to the staff of those schools. Gaby should have gone home on Sunday, but due to the air traffic controllers strike in France, her flight was cancelled. She has had an extra couple of days in England, hoping to return home the day before her 18th Birthday. All in all she has had a memorable time and she is looking forward to coming back to visit us in the future. We hope she keeps in touch with us and we look forward to more exchanges and opportunities to build bridges with Junior FC in Barcelona.